Offering up "down home southern cooking," the Movie Train Cafe will be opening its doors on Friday, May 18th at 501 Santa Clara Street in Fillmore (previously occupied by the Double A Cafe). Restaurant is decorated with neat looking train movie prop decor! Reviewing their Facebook page I detect the following examples of their specialties: Buttermilk biscuit with bacon inside topped with bacon gravy and fresh black pepper, garlic shrimp scampi, chicken fried steak, mashed potatoes and gravy, chocolate heart shaped cheesecakes with fresh raspberries and sliced almonds, cinnamon roll pancakes, chicken and dumplings and much more. Their phone is 805.524.2423. 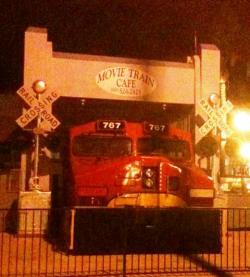 Visit www.facebook.com/Themovietraincafe for more information. Hours are 6am Wed through Sunday.